SoundCloud’s big differentiator is its offering of unofficial, user-uploaded content that the major labels don’t release and that isn’t on Spotify or Apple Music . Or at least they weren’t. The first unofficial single-track remixes just went live on Spotify and Apple Music thanks to their partnerships with music rights management service Dubset. Apple struck a deal with Dubset in March, and Spotify did in May, BPMSupreme reported. But the remixes are finally beginning to stream today, starting with this DJ Jazzy Jeff remix of Anderson .Paak. Dubset works by scanning an entire mix and matching every part of the track to its Mixbank of snippets of official songs based on Gracenote’s audio fingerprinting database. Dubset matches the samples in a mix to these snippets, then distributes royalties for the play evenly to the original rights holders. In this case, Anderson .Paak’s rights holders would get paid because his music is the basis of Jazzy Jeff’s remix. White says 700 million people a month listen to mixed content, making it a big opportunity. But record labels have historically fought against unofficial mixes because they considered them piracy since they weren’t getting paid. Dubset gives them a fair share, so they’ll permit remixes and mix sets to stream on the major platforms. Royalty revenue from the platform is shared with rights holders while Dubset gets a cut. Without the legal grey area of music as a differentiator, Spotify and Apple Music will end up competing on product features like Spotify’s Discover Weekly playlist and Apple’s Beats 1 live radio station, as well as on exclusives and early access to big releases from top artists. The real winners here, though, are the artists and listeners. 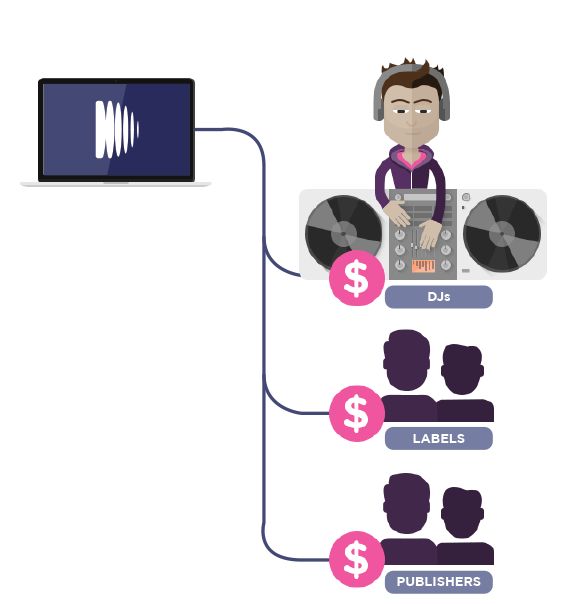 Original rights owners will get paid, remix producers and mixset DJs can share their creativity without being pirates and listeners can hear the music they want no matter how it got made.